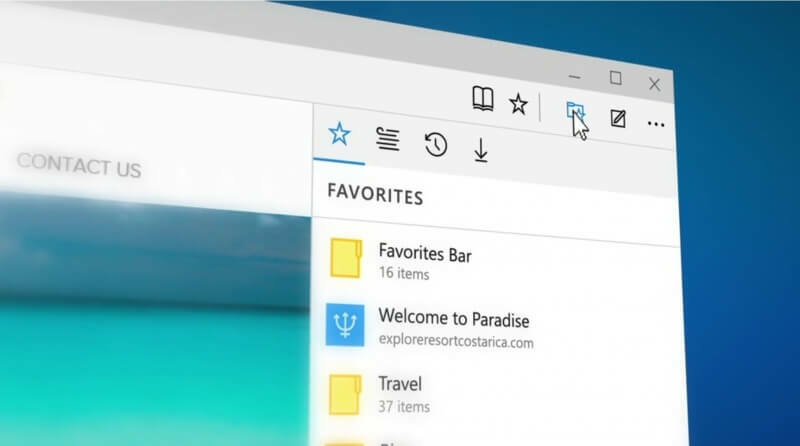 One of the stories to come from Microsoft’s Build 2016 developer conference claimed that the company would include a built-in ad blocker in the next version of it’s Edge browser. Sadly, Microsoft has confirmed that this isn’t true. The status reads that the feature is targeted for the next version of Edge, so it’s understandable why so many people assumed Microsoft would be following the likes of Opera and Brave in bringing native ad-blocking to its browser. 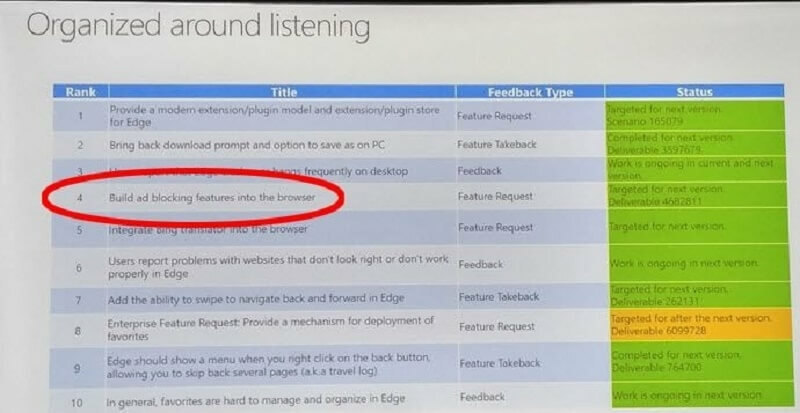 Microsoft has, however, admitted that the slide was misleading, and was actually a “reference to work we're already doing in bringing extensions to MS Edge, such as AdBlock and AdBlock Plus." In other words, the slide isn’t actually related to any built-in ad blocking features coming to Edge. It addresses the fact that future versions of the browser will support third-party extensions so users can install ad-blockers, the same way they do with the likes of Chrome and Firefox. Microsoft recently released Windows 10 insider preview build 14291, which includes extensions for the Edge browser. There are only three extensions in this beta – Mouse Gestures, Microsoft Translator, and Reddit Engagement Suite – but it said that more are on their way, including ones from AdBlock, Adblock Plus, Amazon, LastPass, Evernote and more. No one that knows what they are doing is using Edge anyways. OgnDulk, H3llion and trgz like this. M$ really seems to know what they're doing. By ignoring users requests, it sounds like a great way to endear themselves and their browser to the multitude to me. Despite hating edge as a developer, I was thinking of trying it out as my primary web browser when extensions would be added. I think I'm good with chrome for now, and probably for a very long time. Just curious on anyone's opinion here, I feel like chrome should get a UI update. Nothing huge, but just to get it in line with their new UI design specs in vanilla android, or in their web apps etc. Anyone feel the same or am I just an *****? lol. Who cares if it is built in, as long as it is eventually available as a third party extension? Anyone feel the same or am I just an *****? lol. I feel the same way. Ohh wait you were talking about Chrome, not Edge. noc81, Teko03, OortCloud and 1 other person like this. As CC said, as long as there is plugin/API support third parties (AdBlock) can use to hook into the browser then all is fine. I never expected MS to ship their own. Equally important for me, please sort out the UI and storage locations for favourites and bookmark bar which are currently an abomination. It probably should be a feature that's built into every browser. It's pretty much required with all the ads that have been serving viruses lately. After M$ has gone through all the trouble of ramming Windows 10 down everyone's throat in an effort to use it to collect their personal information, ostensibly to sell it, why would anyone be ploddingly stupid, or should I say "naive" enough, to believe they'd give you something to stop the ads they've essentially created? Wouldn't that be biting the hand that helps feed them? I've repeated again and again, their new CEO Nadella, will prove to be no f***ing good for consumer's interests. This should give a clear hint as to where M$ is heading. How could anyone ever assume MS would code an adblocker..? That's just asinine.. They are a tech business like any other, and though they certainly are no Google in these specific regards, they do rely on income from advertising arrangements. Would you expect Google to block their own ads in chrome by default..? If not, how would it be moral to block any other vendor's ads? Personally, I set up a bit of a script on my router to maintain a bit of a hosts file to block, gathering from a few sources such as MVPS. I still use ublock origin (recent convert) on my pc though, just to handle some of the element reformatting after ads are removed. Even on my old atheros-based wireless-N router, performance seems pretty decent -- doesn't eat up too much memory or add any noticeable delay, and it has the added benefit of adding adblocking on devices where it isn't as easily supported, such as my Android phone on which I still can't get the bootloader unlocked. . . .I feel like chrome should get a UI update. Nothing huge, but just to get it in line with their new UI design specs in vanilla android, or in their web apps etc. Anyone feel the same or am I just an *****? lol. Well, there is the material design update for the windows version of the browser, which brings the aesthetics more in line with the Android/Linux. Considering we got this news at high noon on Friday April 1st, it might be assumed that "ad blocking in edge", was an Aprils Fool's Day joke set up months in advance..!